Canada allows use of firearms in arresting a suspect even if threat of serious injury is not imminent. The Royal Canadian Mounted Police (RCMP) is Canada’s national police force, organised under the Royal Canadian Mounted Police Act.Royal Canadian Mounted Police Act, R.S.C., 1985, c. R-10, at: http://laws-lois.justice.gc.ca/eng/acts/R-10/.The RCMP is “headed by the Commissioner, who, under the direction of the Minister of Public Safety Canada, has the control and management of the Force and all matters connected therewith”.Organizational Structure, RCMP, http://www.rcmp-grc.gc.ca/about-ausujet/organi-eng.htm. The RCMP enforces laws made by Canadian Parliament. “Administration of justice within the provinces including enforcement of the Criminal Code, is part of the power and duty delegated to the provincial governments. The RCMP provides police services under the terms of policing agreements to all provinces (except Ontario and Quebec), Yukon, the Northwest Territories, and Nunavut, and under separate municipal policing agreements to 180 municipalities.”Organizational Structure, RCMP, http://www.rcmp-grc.gc.ca/about-ausujet/organi-eng.htm. a person is not justified for the purposes of subsection (1) in using force that is intended or is likely to cause death or grievous bodily harm unless the person believes on reasonable grounds that it is necessary for the self-preservation of the person or the preservation of any one under that person’s protection from death or grievous bodily harm. e) The flight cannot be prevented by reasonable means in a less violent manner. Makes “requirements in relation to the use of force including use of approved weapons, training and reporting, as well as use/technical specifications for handguns.”Equipment and Use of Force Regulation, R.R.O. 1990, Reg. 926 (Ont. ), http://www.e-laws.gov.on.ca/html/ regs/english/elaws_regs_900926_e.htm.Provincial police have own guidelines for weapons such as conducted electrical weapons (e.g. Tasers), which are also subject to Federal controls.See: Guidelines for use of conducted energy weapons:, at: https://www.publicsafety.gc.ca/cnt/rsrcs/pblctns/gdlns-cndctv-nrg-wpns/index-en.aspx. In 2000, the Canadian Association of Chiefs of Police endorsed a national framework for the use of force that became the basis for police agencies to “build their own use-of-force policies or standards.” The guidelines represent “how an officer enters into or is confronted with a situation, and how he assesses, plans and responds to incidents that threaten officer or public safety. It assists with training officers and provides a reference for decision-making and articulating their actions respecting use of force.”Chris Butler, The Use of Force Model and Its Application to Operational Law Enforcement – Where Have We Been and Where Are We Going?, http://www.cacole.ca/resource%20library/conferences/2009%20Conference/ Chris%20Butler.pdf. b) the escape cannot be prevented by reasonable means in a less violent manner. report findings and make recommendations. In 2015, the Human Rights Committee issued its Concluding Observations on Canada's sixth periodic report on its implementation of the ICCPR. The Committee noted Canada's "efforts to establish oversight and accountability mechanisms to investigate serious incidents involving the police at the federal, provincial and territorial levels", but expressed its concernHuman Rights Committee, Concluding Observations on Canada's sixth periodic report, UN doc. CCPR/C/CAN/CO/6, 13 August 2015, §11. It called on Canada toHuman Rights Committee, Concluding Observations on Canada's sixth periodic report, UN doc. CCPR/C/CAN/CO/6, 13 August 2015, §11. strengthen its efforts to ensure that all allegations of ill-treatment and excessive use of force by the police are promptly and impartially investigated by strong independent oversight bodies with adequate resources at all levels, and that those responsible for such violations are prosecuted and punished with appropriate penalties. In 2015, the Human Rights Committee issued its Concluding Observations on Canada's sixth periodic report on its implementation of the ICCPR. The Committee expressed its concernHuman Rights Committee, Concluding Observations on Canada's sixth periodic report, UN doc. CCPR/C/CAN/CO/6, 13 August 2015, §11. about reports of the excessive use of force by law enforcement officers during mass arrests in the context of protests at the federal and provincial levels, with particular reference to indigenous land-related protests, G-20 protests in 2010 as well as student protests in Quebec in 2012. The Committee was also concerned "about reports that complaints are not always promptly investigated and that the sanctions imposed are of a lenient nature".Human Rights Committee, Concluding Observations on Canada's sixth periodic report, UN doc. CCPR/C/CAN/CO/6, 13 August 2015, §11. Canada is not a state party to the 1969 American Convention on Human Rights and has not accepted the jurisdiction of the Inter-American Court of Human Rights. The Inter-American Commission of Human Rights could make recommendations to Canada on human rights issues on the basis of Canada's membership of the OAS. In national jurisprudence the courts have generally allowed a far greater amount of force in the course of arrest than against anyone already in police custody. 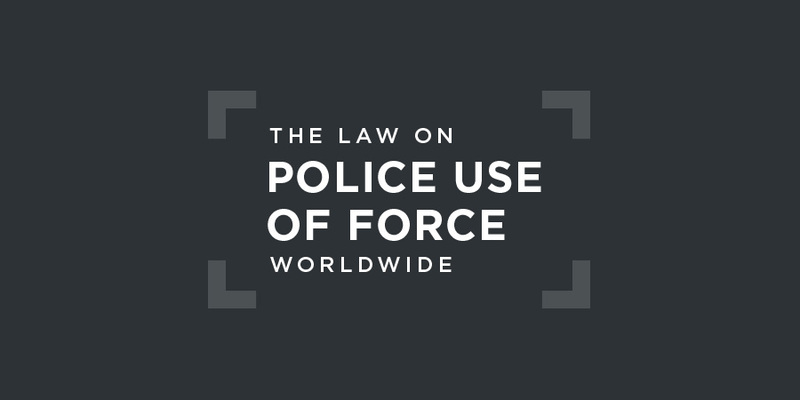 These cases are in accordance with Section 25(1) of the Criminal Code, which allows officers to use "as much force as is necessary" when performing their duties. In R. v. Nasogaluak, for example, the Supreme Court ruled unanimously that the sentence shouod be reduced. The case concerned the excessive use of force during the course of an arrest, which resulted in the accused suffering two broken ribs and punctured lungs. This case contrasts with the Ontario Court of Appeal's decision in Tran, where a similar beating, resulting in a broken jaw, warranted a stay of proceedings because, amongst other things, the appellant had surrendered into police custody and "no degree of force was warranted". The courts have made it clear, though, that once a person is in custody, particularly when handcuffs or other physical restraints are used, the police must proceed with caution. A detainee’s threats of misbehaviour do not justify police use of force, unless these actions compromise the officer’s safety. Thus, despite the accused’s “disgraceful conduct”, Justice Trotter of the Superior Court found two Toronto Police officers’ decision to tie an electrical cord around a suspect's face to prevent him from spitting at them as a breach of Sections 7 and 12 of the Charter. In R. v. Cousins, however, Justice Vaillan court ordered a stay of proceedings when police officers arrested a man in a movie theatre and used the arrestee's body to open the two theatre doors on their way out.See: A. Herscovitch, "Excessive Force and the Charter: When the Handcuffs Go On, the Violence Must Stop", Toronto Law Journal, October 2012, at: http://c.ymcdn.com/sites/www.tlaonline.ca/resource/resmgr/toronto_law_journal_2012/toronto_law_journal_-_octobe.pdf.